The question of how Stephen Paddock was able to get 23 guns in the hotel without anyone noticing may have just been answered — the service elevator. 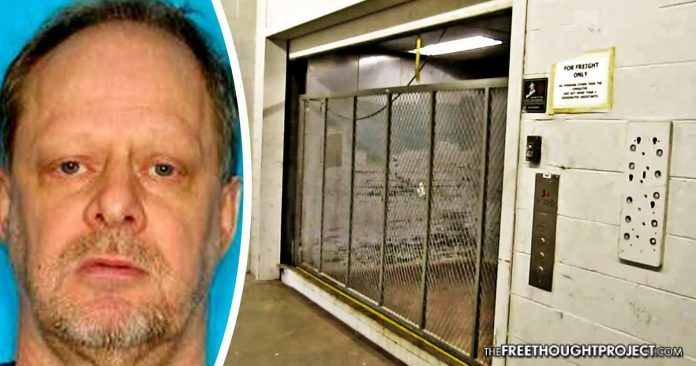 Las Vegas, NV — One of the most asked questions about the massacre in Las Vegas was, “How did Stephen Paddock get hundreds of pounds of ammo and nearly two dozen assault rifles into his suite on the 32 floor of Mandalay Bay without anyone noticing?” Thanks to a new report, we may now have that answer—he was allowed to use the service elevator. The official story of how and why Stephen Paddock murdered 58 people at a music festival in Las Vegas last week is falling apart. This week, as TFTP reported, police made massive reversals in their narrative which raised a myriad of questions and speculation. Now, according to a report from ABC, we are learning that Paddock had access to and used the service elevator at the Mandalay Bay Hotel and Casino in the days leading up to his attack on the country music festival. According to AP, officials briefed on the investigation told ABC News that Paddock’s access to the service elevator was a perk for high rollers. No further information about when and how he used the elevator has been released. What makes this new revelation particularly interesting is that on Sunday, chief executive of Wynn Resorts, Steve Wynn slipped up and seemingly indicated that he knew Paddock used the elevator—days before officials released this information to the media. This tidbit of information was offered up randomly as they were not talking about elevator use at all. When Chris Wallace heard Wynn say this, however, he immediately asked for clarification. “Did he (Paddock) go in the service elevator, Steve?” asked Wallace. Wynn then proceeds to fumble his response, seemingly knowing he’d just revealed information the public was not given. “Uh, Uh, Uh, I’m just saying, anything like that…I’m not sure if he did. But nobody ever goes in the back of the house unaccompanied by security,” replies Wynn. This now raises the questions: Was Paddock accompanied by security in the service elevator of the Mandalay Bay? And, if so, how did security not notice the 23 guns and thousands of rounds of ammunition Paddock was loading up in his room? It is entirely possible that a slip up here and there at a casino could happen from time to time. However, the idea that not one of the hundreds of security personnel, casino observers, police officers, nor the thousands of cameras at the Mandalay Bay resort captured or saw anything suspicious as this man lugged massive bags of weapons and ammo through the service elevator while setting up his own cameras in the hall, is preposterous. Given the fact the police have now shifted their original story of Jesus Campos being hailed as a “hero” for stopping the shooting, to arriving 6 minutes before the shooting, and that Paddock arrived three days before police originally claimed, and the fact that Paddock was granted access to the security elevator—one should begin to question every aspect of this massacre. “By engaging the shooter ahead of time during this event, it could’ve saved a lot of heartache,” he added. However, as this new information shows, not only was Paddock not stopped from opening fire on a crowd of 22,000 people, it now appears that he actually had help.